If you thought simple kurtis are as good as it gets when it comes to comfort and style, think again. The jacket kurti is the ultimate style booster for the new year. Read on and find the best jacket kurti combinations there are. Jacket kurti is an indo-western cousin of the traditional kurti. It is worn with a jacket which could be either attached to the kurti or not. Some variations are made to look like jackets themselves. If you find yourself wondering why it is a must-have for your closet, the answer is simple. The comfort and elegance of a kurti along with the finishing of a jacket; these are the two things that are in store for you when it comes to a jacket style kurti. Let us now explore the various options that are available for you to try on, and which occasion deserves them the most. We’re hoping you’ll find your next go-to outfit as you read on! 1. Cotton Kurti With Jacket For Sunny Days In The Outdoors! Cotton has been known to be the most breathable, skin-friendly fabric there is. That combined with the silhouette and structure of a kurti sounds and looks extremely appealing, and you cannot deny this. A day well spent is a day spent in comfort, especially if you’re required to be outdoors at all times. That is where a cotton kurti with jacket comes into play. It enables free movement and simplicity along with being a presentable ensemble. Style Tip: A pair of hoops and a pair of distressed denims. Leave no room for mistakes! 2.Kurti With Long Jacket - Slay That Style Cape! Long jackets have been the talk of the town ever since they were introduced on runways around the globe. They are slimming, free flowing and add the perfect structure to any given outfit. They went on to become a very common addition to modern day kurtis. Kurti with long jacket is a staple you can’t ignore. It is a refreshing take on already prevailing silhouettes like the Anarkali, the A-line and the fit & flare kurtis we have all come to love. This jacket kurti combination can have a long or a short kurti inside, and it can be paired up with denims or even palazzos. Style Tip: A pair of stilettos will add the extra oomph, so will a pair of wedges. Don’t forget to let your hair down with this one! 3.Kurti With Jacket Pattern -Your Fashion Faux Pas Saviour! Fashion Faux pas is a nightmare that absolutely no one wants to go through, but probably has been a fashion disaster once in their lifetime. A kurti with jacket pattern is your saviour. This style comes with an attached jacket that may not go all the way to the back, but gives the exact same effect. The best part about this jacket style kurti is that it avoids any possible mismatch that usually comes with buying a jacket separately. Style Tip: Pair it up with matching churidar pants and you will have yourself a perfectly balanced outfit! 4.Kurti With Long Jacket Pattern For The Trailblazing Diva! We all know how trendy long jackets really are, and we’re sure everyone has at least one of them in their wardrobes just waiting to be worn for the perfect occasion. Well, a kurti with long jacket pattern does not have to wait to be worn; it already has a companion. 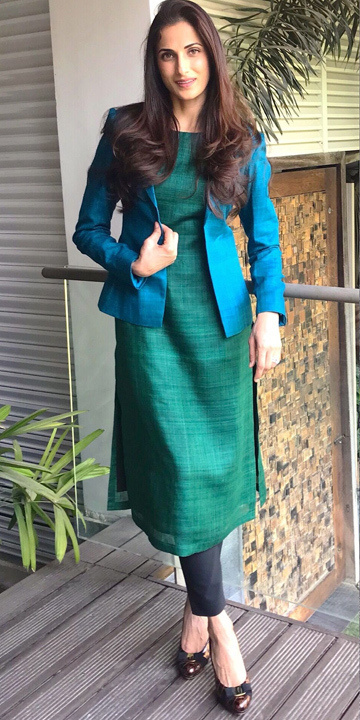 This is one of the most common jacket style kurti that can be seen on influencers, celebrities, and other people alike. Style Tip: To embrace it to its full potential, pair it up with a long skirt if the kurti is short, and a pair of palazzos if the kurti is long. 5.Keeping It Cute With Short Jacket Kurti ! Short jackets don’t just look good when they’re denim, and we have proof. Short jacket kurti is a perfect way to keep it casual and not too over the top as it helps you blend in with the crowd. College going girls can experiment with this style to their heart’s content and no one will bat an eye. Style Tip: To take things to the next level, add a pair of Jhumkas and distressed boyfriend denims along with kolhapuris to make your outfit statement-worthy. 6.Designer Kurtis With Short Jacket to Level Up Your Game! If your personal style often manages to catch everyone’s attention wherever you go, then you know how important it is to stay at par each time you wear something. The pressure of looking good is endless, and that’s where designer kurtis come in. Designer kurti with a princess panel jacket is our personal favourite. Next in line are simple designer kurtis with short jacket that perfectly complement each other’s silhouette. This can also be worn as a dress or dressed up with dhoti pants. Style Tip: Juttis will be a perfect addition to this already perfect outfit. 7.Embroidered Jackets For Kurtis- A bling Queens Dream! Embroidery is a treasured gem of India, and it is more than essential to regard it for what it is. It is intricate and visually appealing on almost every type of outfit. The effort behind an embroidered outfit is all the more reason to embrace it. Embroidered jackets for kurtis are a win-win for the weaver and the wearer. Regardless of the length of the jacket and the kurti, dhoti pants make for an excellent pairing with these kinds of kurtis. Style Tip: If your jacket is heavily embroidered then we suggest you stay away from heavy jewellery. 8.Quick Way To Fusion -Ethnic Jackets For Kurtis! A new year calls for a new round of festivals, and as Indians we know what this means. A new outfit for every single occasion is how we roll, and occasions are many. 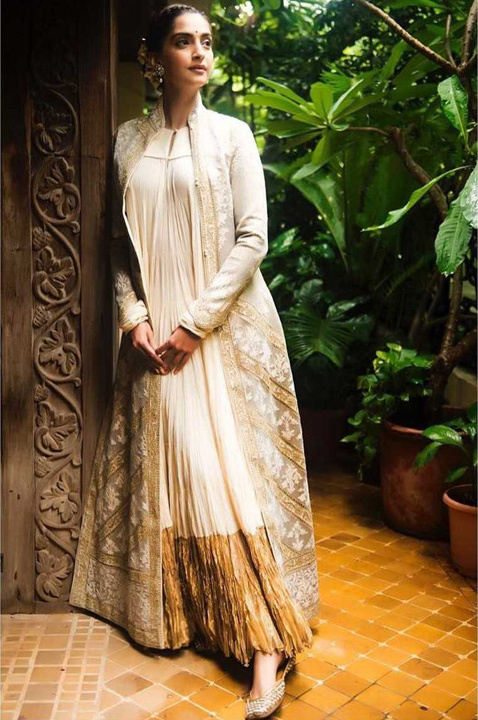 To beat the outfit blues, make ethnic jackets for kurtis your go-to! Ethnic jackets are the perfect way to strike a balance between overdressed and underdressed. Style Tip: With a short or a long kurti to accompany ethnic jackets, all you need is a pair of skinny jeans and Chand baalis! 9. Brighten Up Dull Chores In A White Kurti With Jacket ! White is one of the most common colours, or should we say non-colour when it comes to kurtis. A white kurti is perfect for occasions like Independence Day, Republic Day, Raksha Bandhan, and Navratri. This said, white kurti with jacket that is colourful and vibrant will give your outfit will give it the mush needed splash of joy. Style Tip: Slip into a pair of thong sandals and a dupatta to go with your ensemble to make it a lot more interesting. 10. Black Kurti With Jacket For The Charming Vixen! As we all know, black brings out the best in every single colour. So, a black kurti with jacket that is again, colourful, is an amazing choice of wear if you want something you can wear in your everyday life. Adding a pop of colour to every outfit is an eclectic choice and should be made more often. Don’t shy away from experimenting, it might just make you the next diva of your college or workplace. Style Tip: Add a pair of colour block heels and a colourful sling to take it to a whole new level. A net jacket is a sure-fire way to ensure your outfit gets the much-deserved attention. A see-through jacket like this one definitely sees you through perfection! A crocheted one does a lot of rounds in the industry, and so does a sheer jacket. This one is easy to accessorize, and one can also add a belt to give it structure. Style Tip: We would wear our net jacket with kurti a pair of heavy Jhumkas and a maang tika! Now that we’ve explored all there is to jacket style kurti, we’d like to see what your creative minds come up with. The secret ingredient though is a touch of elegance and a vibrant palette so don’t forget to add that to your combination of jacket and kurtis!